Can We Cool Our Make-up Air? A common challenge for industrial spaces that utilize make-up air, especially in hot humid environments, is keeping the air cool and humidity low in the Summer months. Spaces that exhaust large amounts of air need to replace that air with make-up air, typically from outside. Conditioning that air in the Winter months is relatively simple. We just heat the air as it comes in, typically with gas-fired burners directly in the air stream or indirectly via a heat exchanger. Conditioning that same air in the Summer months can be more of a challenge, as in most cases 100% of the air in the space is exhausted with no recirculation. Therefore, 100% of that air must be made-up with the make-up air unit. With high heat and humidity conditions, that can represent a fairly high load. However it can be done effectively and efficiently. What is required for cooling with 100% outside air make-up units is a compressor/condensing unit that is designed for high and variable loads. You won’t find these through most commercial HVAC companies, as their units are typically designed for the usual indoor air conditioning application, which would obviously include large amounts of recirculated air. For make-up air, we need to consider not only the large load, but how that load varies with changing conditions. Industrial-grade condensers and digital scroll compressors are typically the best answer for these conditions. 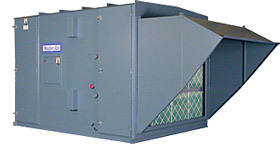 With over 30 years experience in the industrial HVAC field, and access to top-quality manufacturers for superior products and after-sale support, RJ Owen Associates can design and offer heated and cooled air make-up units to handle 100% outside air, even in the tough environmental conditions of the Southeastern United States.